PlayCpl. Damon A. Mclean/Marine Corps. A 74-year-old man has been found alive in an apartment building in Washington, D.C., five days after it was nearly gutted by fire, officials said. 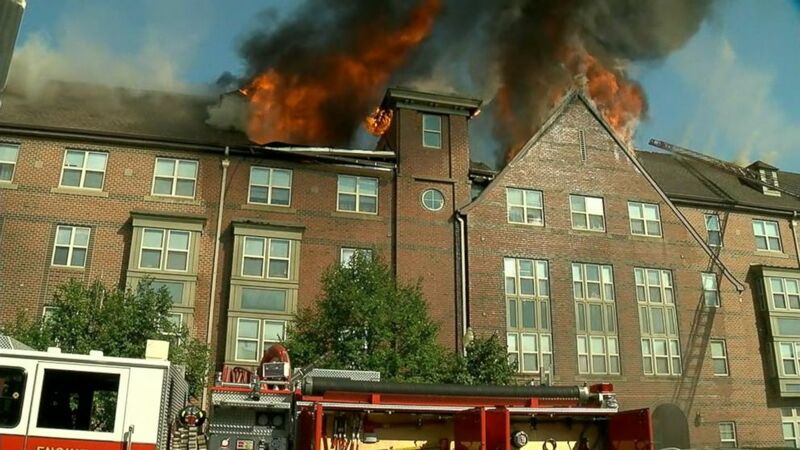 The senior citizen was found by crews that had been hired by the building's owners to evaluate the safety of the structure so that fire marshals could enter, D.C. Mayor Muriel Bowser said Monday at a news conference. The man was taken to a local hospital with non-life-threatening injuries, she said. The mayor said she believed he'd been in his apartment since the blaze last Wednesday. The man's identity has not been released but Bowser said he lived in a second-floor apartment. Cpl. Damon A. Mclean/Marine Corps. 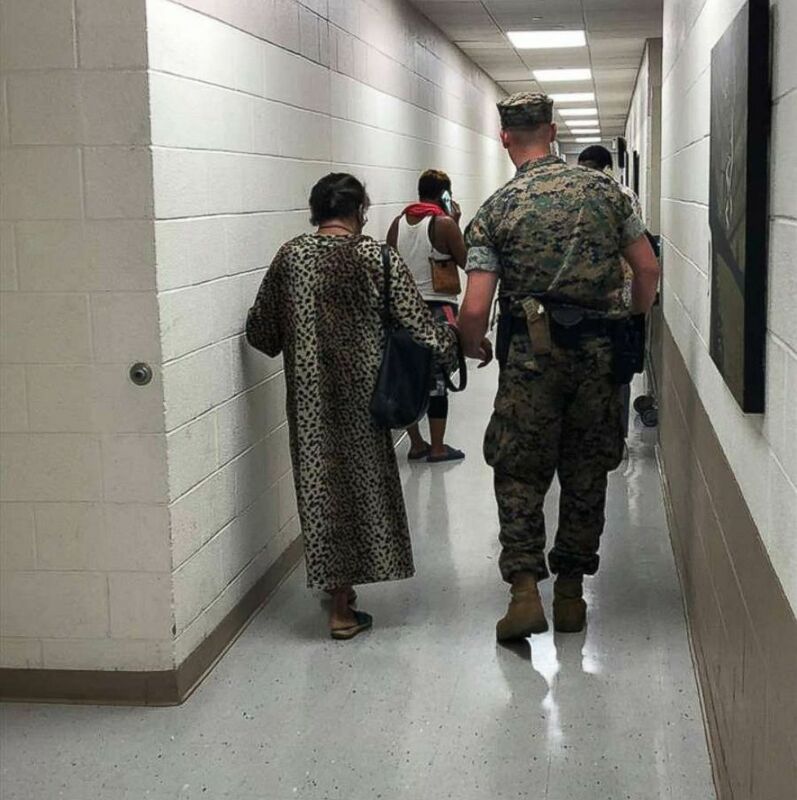 U.S. Marines assist firefighters with saving senior citizens from a burning building in Washington, D.C, Sept. 19, 2018. "I can’t really tell you about his condition at this point except that he has non-life threatening injuries," Bowser said. "It appears that based on the report that I got from the building workers that he was sitting in his apartment. The workers helped him into a chair and out of the building and he is now being treated." On Sept. 19, dozens of senior citizens had to be saved from the fire at the four-story Arthur Capper Senior Public Housing building. Video posted to social media showed flames shooting out of the top of the apartment building. Bowser said Monday that there were 161 occupied units in the building and that her office was trying to connect each household with a case manager. At the time of the fire, the fire chief said four people had been transported to local hospitals. The D.C. Fire and EMS chief later said the alarm system at the building did not work, according to ABC affiliate WJLA-TV. 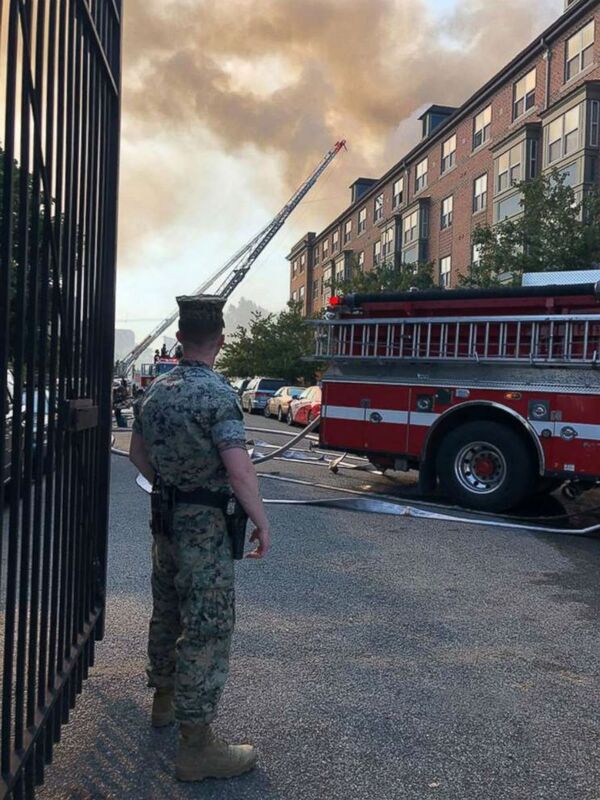 U.S. Marines assist firefighters with saving senior citizens from a burning building in Washington, D.C., Sept. 19, 2018. Firefighters and several U.S. Marines were captured on video running toward the two-alarm blaze. Residents were taken to the Marine Barracks Washington Annex nearby, the Marines said in a statement posted to Facebook. ABC News correspondent Kenneth Moton, who was at the scene, said "the entire neighborhood was filled with smoke for hours." "From the moment they arrived on the scene and well into the next day, D.C. firefighters had a constant stream of water on what was left of the building," he said. "It was pretty much gutted. I could see several fire truck ladders in the air spraying water to prevent hot spots from flaring up." The situation is still under investigation, Bowser said. "Clearly this has prompted all district government agencies to re-verify with the building owner and building management all contacts with tenants and make sure that those contacts match the efforts that we have undertaken this weekend to make sure every resident -- whether they were placed in a hotel last Thursday and Friday or whether they’re with family and friends -- that they have contact and that they have available resources," she said. ABC News' Sarah Shales contributed to this reporting.